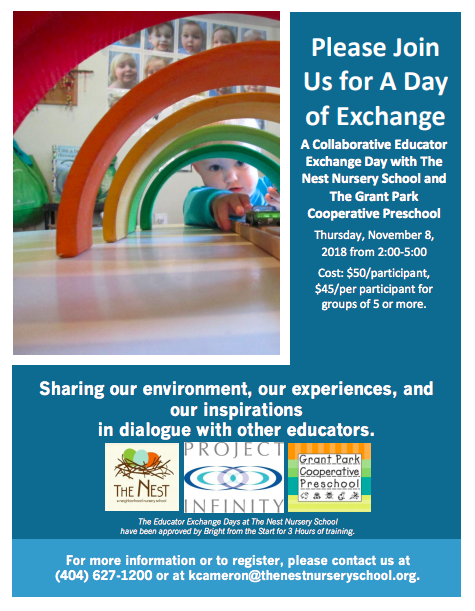 As a proud member of Inspired Practices in Early Education’s Project Infinity, The Nest is pleased to participate in Educator Exchange Days. 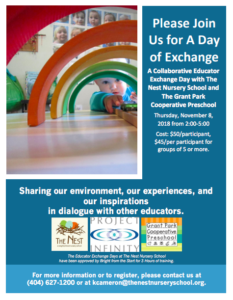 To register for our collaborative Educator Exchange Day with the Grant Park Cooperative Preschool on November 8, 2018, please click on, print, and complete the following form: Educator Exchange Day registration form. Launched by Project Infinity schools in the fall of 2008, Educator Exchanges are a response to increasing interest by area educators to visit schools within the Project. During Educator Exchanges, participants are encouraged to use their visits as a framework to support thinking about their own unique contexts and their own role as educators. In order to support thinking both during and after Educator Exchanges, an Observation and Reflection Guide is available. The overall aim of Educator Exchanges is to give visibility to ongoing learning processes of children and adults in each Project school. By keeping a style of responsibility and transparency, Project educators share their ongoing evolution of analyzing and interpreting experiences. We assert that all schools operate from some set of core values and that one responsibility of adults is to make explicit which core values are embraced and then to continually observe the alignment between values and actions within schools. The general format of Educator Exchanges includes presentations of children’s and teachers’ work, informal time in the school and classrooms, informal access to educators of the school, and formal group discussion. Since their introduction during the 2008-2009 school year, Educator Exchanges have proven to be a powerful professional development tool for both educators within Project Infinity, as well as for participating educators from the surrounding community.